Professional athletes don’t get to the top by accident. It takes superhuman levels of time, dedication, and focus—and that includes paying attention to what they put in their bellies. In this series, GQ takes a look at what pro athletes in different sports eat on a daily basis to perform at their best. 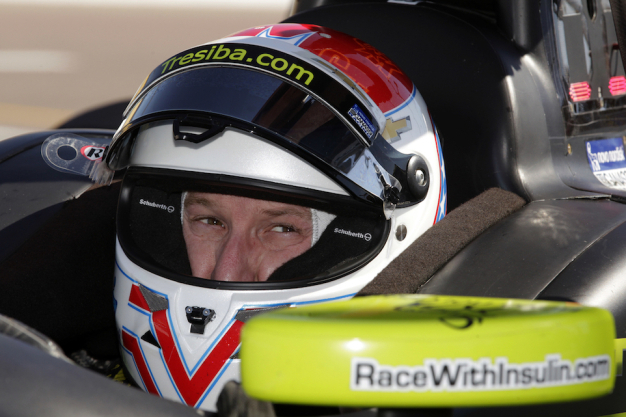 Here’s a look at the tricky diet of Charlie Kimball, the IndyCar racer who won’t let diabetes slow him down. Charlie Kimball was three years into his career as an IndyCar driver, having deferred entry into Stanford to pursue a sport he learned about from his father (himself a race-car engineer/designer), when a sudden strange rash brought everything to a halt. The condition was benign. But the doctor who checked him out nine years ago had some follow-up questions. “He asked if I had anything else wrong with me I wanted to ask him about,” Kimball says, “and I said, ‘No, I’m 22,’ like that meant something. Then I mentioned I had been thirsty, drinking eight, ten, twelve bottles of water a night, and going to the bathroom all the time.” The doctor had Kimball get on a scale, and he realized that he’d lost 25 pounds since the last time he’d weighed himself, just five days before.